According to statistical sources, approximately 40-50 horses contract rabies each year. In fact, the number of cases reported may be low because not all horses that die or are euthanized due to neurological signs, are tested for rabies. Since the disease is nearly always fatal, and humans can be exposed to it, it's important to know the causes, diagnosis, treatment, and ways of preventing the disease. The rabies virus is present in the saliva of a rabid animal and generally enters at the site of a bite, although saliva on an open wound or mucous membrane also exposes the horse to rabies. The virus travels to the brain along nerve networks, then travels back along nerves to the mouth, causing any stricken animal to become an infectious source if it bites another warm-blooded animal. Horses typically suffer from a paralytic form of rabies instead of the "mad" form exhibited by dogs and other animals which contract the disease. Horses frequently come in contact with skunks, foxes, bats, and other animals that may have rabies and can be infected by a bite from a rabid animal. Often, these bites, which are usually on the muzzle or lower legs, go unnoticed. The virus which is in the saliva of the rabid animal replicates in the bite wound and travels through the peripheral nerves to the central nervous system. The incubation period can be as short as two weeks or as long as several months. Horses often die within three to five days of the onset of clinical signs. In most areas of the country, bites from skunks are the primary way horses contract rabies, but in New England and throughout the southeastern states, rabid foxes and bats are also known to infect horses. 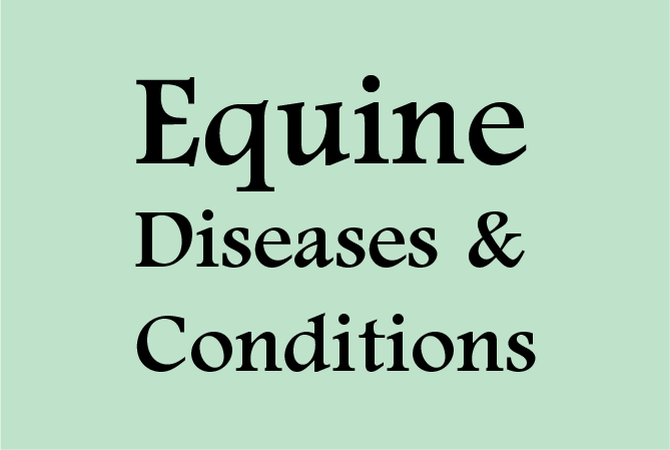 Several practical steps can be taken to prevent a horse from contracting rabies. A routine, yearly rabies vaccination program for all horses, dogs, and cats in endemic areas should be followed. Although not 100% effective, the vaccine is usually highly protective. Any horse bitten by a wild animal should be considered exposed to rabies and should be re-vaccinated immediately. If an unvaccinated horse is bitten, the horse should be quarantined and kept under observation for six months. Rabies is a reportable disease and should be disclosed to the local health authorities. Once clinical signs appear, it is usually too late for any effective treatment because progression of the disease is very rapid and most horses die within three to five days after exhibiting clinical signs. Horses that are known to have been exposed to rabies should have all wounds cleaned and lavaged with a disinfectant recommended by a veterinarian. Rabies antiserum should be infiltrated around the bite wound. Because of the serious public health risk and fatal nature of the disease, a horse showing clinical signs with a diagnosis of rabies should be euthanized immediately. A knowledgeable veterinarian can determine the best course of action and help horse owners prevent further endangerment to themselves and other animals in the vicinity.